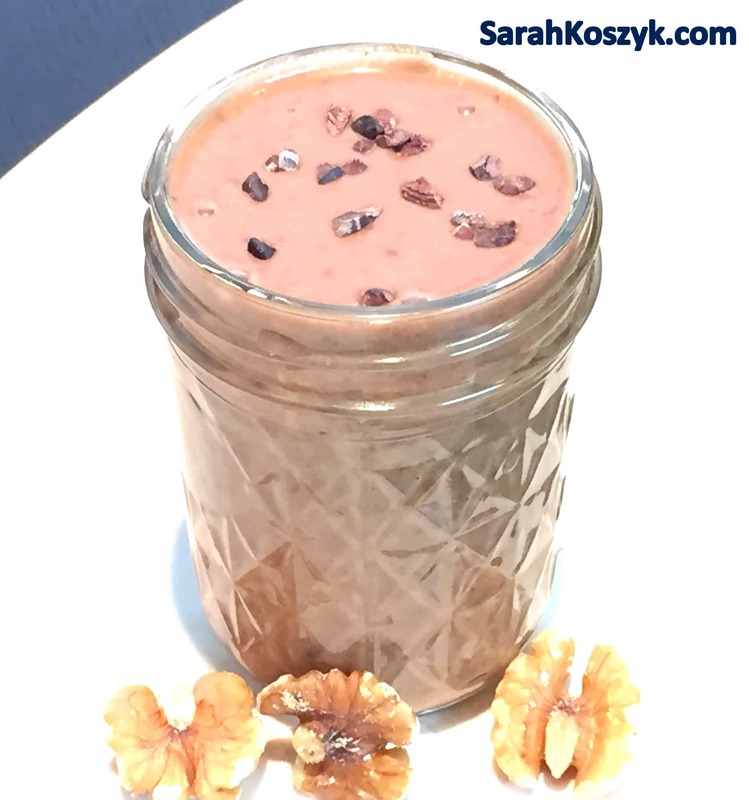 Cacao and Date Delight Smoothie + Anti-Aging Smoothies! Drink your way to pure beauty bliss with this Cacao and Date Delight Smoothie! 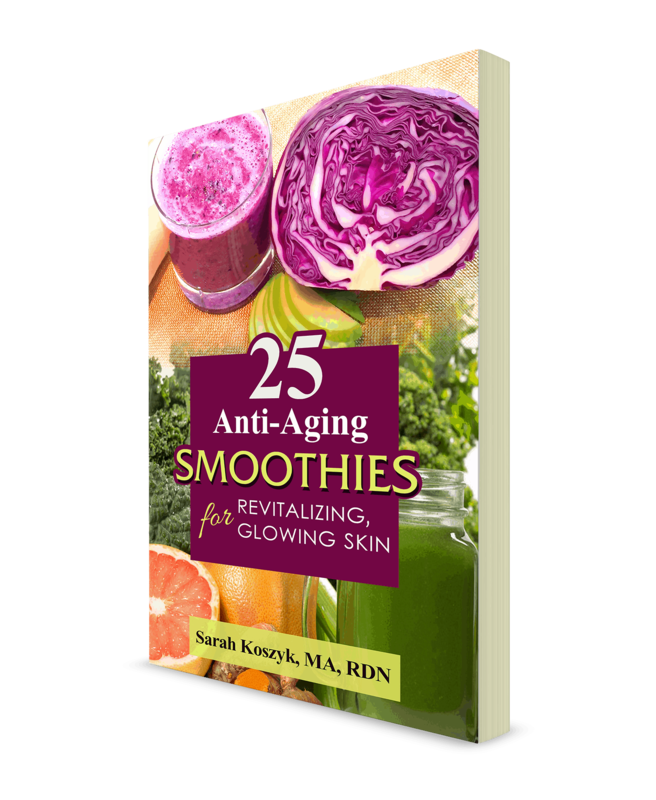 Plus, enter to win Sarah Koszyk’s exclusive Anti-Aging Smoothie Cookbook! Ever wondered if you could save some money on those expensive beauty products and instead get the nutrients you need from the food you eat? Well, if your answer is yes, this post’s for you! I’m so excited to introduce you today to a fellow colleague and great friend of mine, Sarah Koszyk! Sara is a Registered Dietitian Nutritionist who blogs over at Family. Food. Fiesta. Sarah has been busy the last few months working away at solving the answer to our question: which foods revitalize your skin, giving it that awesome glow?! The answer: this Cacao and Date Delight Smoothie plus 24 other delicious and nutritious smoothies that will make your jaw drop and skin tighten! 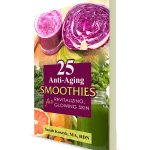 Sarah’s latest book is not only is filled with a collection of great recipes, but also important tips on how to get creative with your smoothies. As a nutrition expert, Sarah offers sound advice on how to amp up the nutrient density of your beverages while also using unique and innovative flavors to excite those taste buds. Don’t wait another minute! Dive into this Cacao and Date Delight Smoothie as you enter the giveaway below to win yourself a copy! Trust me, you don’t want to miss this giveaway! This is a delectable sweet treat with no added sugar. The dates are natures' sugary fruit - perfect for a sweet-tooth craving. It’s okay if you don’t win! Sarah’s offering an excellent deal if you want to get your hands on her latest book! Click here to get your copy! I love when we can use nutrition to make our bodies better instead of using something made in a factory! Plus I really like smoothies. 🙂 Her cookbook looks awesome! Her cookbook is amazing!!! And Amen to that! Great minds make smoothies alike! I just posted the same recipe today 🙂 LOVE this smoothie with some ice cubes blended in~perfect for the sultry weather we’re having this week! AMEN sista! I love this too- and am so obsessed with the book. It’s beautiful! Just got a Ninja blender in the mail YESTERDAY! This would be perfect! OMG- best present ever! Totally, this smoothie has your name on it! Enjoy!